How to Smoke Pork Spare Ribs Like a Pro! This is my preparation and cooking style for perfectly smoked spare ribs. I have had great results by following the guidelines listed below. Ribs are great when they are smoked well, but they can turn out pretty bad if smoked incorrectly. There are many different techniques to produce a great smoked rack of pork ribs. The best way to find out what works for you is to practice and experiment with different available recipes, or new recipes you come up with. 1. To remove or not remove the membrane; that is the question. The answer smokes down to this: If you do not remove it, your ribs will not be as tender as they can be. That is a fact!! Removing the membrane is not hard at all. It is shiny and located on the bone side. 2. Use a sharp paring knife and start at one end. 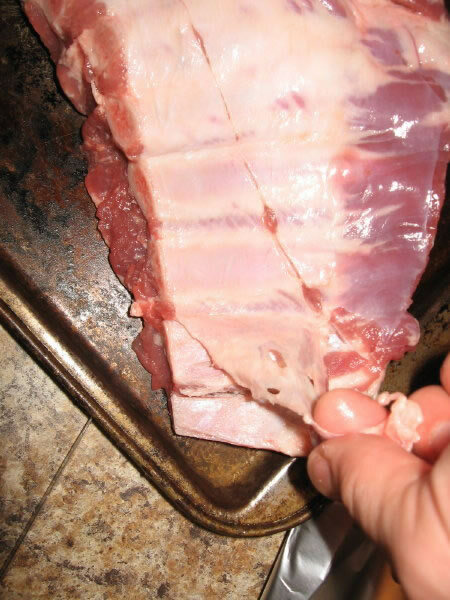 Slide your knife under the membrane and make short cuts while lifting the membrane from the rib bones. 3. The membrane should start to separate from the ribs. If you can cut a large enough flap, you should be able to rip the membrane from the ribs. 4. Try not to cut the rib meat in the process. After some practice you will get the hang of it! 1. It is important to prepare the pork ribs the night before you are going to smoke them. This will allow the rub to work it's magic. I have a few rub recipes listed here that you can use. The goal of a rub is not to overpower the flavor of the meat, but to add flavor. 2. 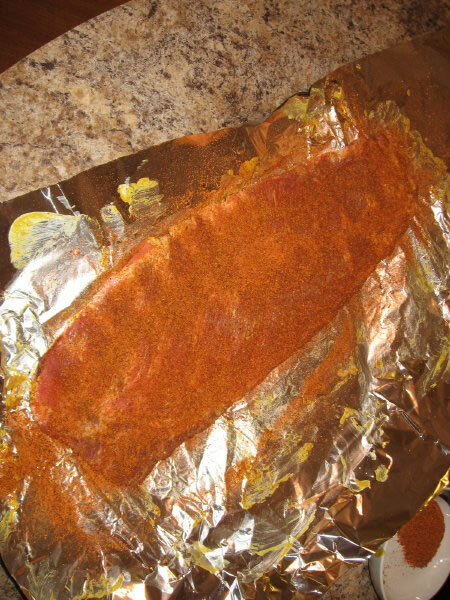 Before applying the rub, wet the rack of ribs with olive oil or mustard. This will help the rub stick. I use mustard all of the time and the mustard flavor is never noticed at eating time. By wetting the ribs, the rub sticks well, and a great crust will form. Some people like to marinade their ribs, boil them, etc. The purpose of this article is to explain how I smoke them. The pork ribs turn out great every time and people love them. Need I say more. If you have a great recipe or twist you would like to add, feel free to email me at aaron@thesmokerking.com. 1. 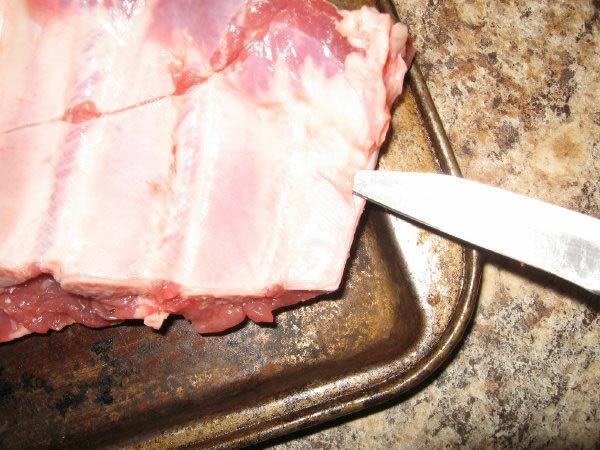 Remove the ribs from the refrigerator about 45 minutes before cooking them so they are closer to room temperature. If you put a cold rack of ribs on the pit, it takes longer to cook them and you waste wood/charcoal. 2. When I smoke ribs, I make a mixture of 1/4 cooking oil and 3/4 apple cider vinegar in a spray bottle. The vinegar adds a good flavor and helps to tenderize the meat. 3. Shake the bottle and spray the ribs down every 45 minutes or so. 4. I smoke the beef ribs at a consistent temperature of 225 degrees F for about 1 hour per pound, but usually no more than 6 hours. 1. There are many methods for smoking ribs. I have tried just about very way imaginable. 2. I usually smoke a 5 pound rack of spare ribs for 4.5 hours, spray them down with my mop mixture, and wrap them in foil for 1 more hour. They turn out pretty darn good. Smoking them this way will produce a very tender rack of ribs. They will not be crispy on the outside due to wrapping them in foil. 3. Some people apply a BBQ sauce the last 30 minutes of smoking or so. If you do this, remember the BBQ sauce contains sugar and tomatoes and it will burn quickly. Watch your ribs after you apply the sauce. 1. Heat the smoker to 250 degrees F or so. Try to maintain 225-250 degrees F during the entire smoking process. The ribs are done when the internal temperature reaches 175-180, but the best way to tell when ribs are done is to follow #3. 2. Place the ribs bone side up in the smoker: Yes, bone side up. I use a rib mop sauce that has no or very little brown sugar and no tomato products in it. These two ingredients will burn before the meat is done, and can produce bad results. It is best to apply a finishing sauce or glaze towards the last 30-40 minutes of smoking. When applying the finishing sauce, turn the ribs over so that the bone side is down then apply the sauce. 3. The ribs are done when the meat retracts and exposes the edge of the rib bones by about 1/2 inch or so, and basically each rib section will tear apart with ease. Grab a rib bone and twist. If it releases from the meat, or is pretty darn close, the ribs are done. The internal meat temperature will be about 175 F r so when done. An instant read thermometer is a must have for checking if the ribs are done. 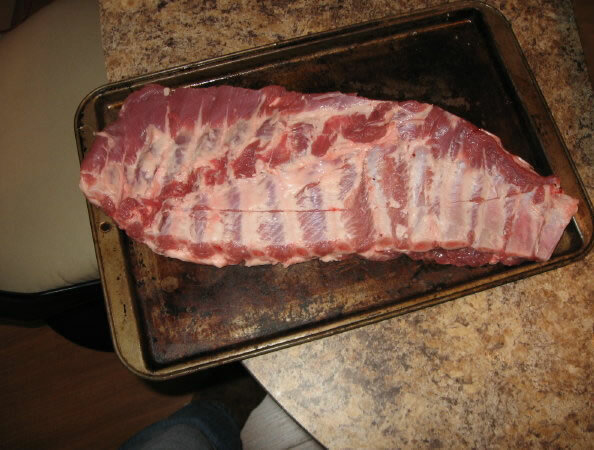 After a while, you will be able to tell if they are done or not by the feel and look of the ribs. Using different types of woods will produce different smoke flavors in the meat. I usually use mesquite, apple, and charcoal. Too much mesquite can add too much of a smoky flavor to the ribs, so use it sparingly. Hickory and oak are also some of the commonly used woods for smoking ribs. Cut down the middle of each strip of meat between each rib bone. It is easier to see the bone when you slice the bone side up. Add your favorite sauce, and enjoy.